A soul-stirring devotional offering of mantras which pay homage to Lord Ganesh who blesses his devotees with prosperity, fame and also destroys obstacles. It is for this reason that He is invoked before the undertaking of any task with pious incantations of his name. He is the first god to be worshipped at every occasion, every project, every work, every sojourn and every thing of any importance. 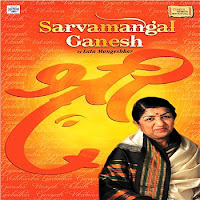 Lata Mangeshkar makes the Ganesh Festival special and memorable for every Ganesh devotee! !